Cisco offers a full stack of offerings, including calling, conferencing, meetings, team collaboration, video, contact center, and devices. Cisco continually emphasized the ability for service providers to differentiate from competitors by offering Cisco’s full stack solution. The midmarket is where the growth is for service providers. The company announced a new midmarket offering and emphasized the growth opportunities for service providers in this largely untapped market. The new offer includes Cloud Calling based on Cisco BroadCloud, the full Webex Collaboration suite, and Cisco devices, and is included in the Cisco Collaboration Flex Plan, making it easy for service providers to sell and for customers to buy. Bridges, not islands. Cisco is focused on creating connections and enabling interoperability with both Cisco and third-party solutions, with a commitment to a consistent user experience. Cloud first, not cloud only. While Cisco is obviously focused on the cloud, the company is also supporting hybrid solutions to support customers in transition. There were lots of product announcements as well as discussions about the road forward for Broadsoft service providers. Cisco offers two platforms for service providers, including HCS and BroadWorks which are hosted in their data centers, and BroadCloud and Webex which are hosted in the Cisco cloud. These support a variety of applications, including calling, meetings, teams, and customer care. The traditional engagement with service providers included perpetual licenses for HCS and Cisco BroadWorks, and monthly recurring charge (MRC) based for BroadCloud for carriers, where UC-One is the white label user UC experience accompanying Cisco BroadWorks and BroadCloud for Carriers. Cisco announced that the Cisco Collaboration Flex Plan will include new subscription based calling offers for service providers, BroadCloud Calling, and BroadWorks (coming in 2019), where the UC experience is Webex Teams with a service-provider brandable calling app. To help clarify some of this, I spoke with Cisco Product Marketing Managers Andy Johnston and Sonali Karnik, who describe Cisco’s various calling and meeting offers for service providers. While small businesses have led the way in adopting cloud communications, Tessler told the audience that there’s a huge addressable market in the 100-1,000 user segment, noting, "Collaboration isn´t for big businesses anymore: it is for everyone." 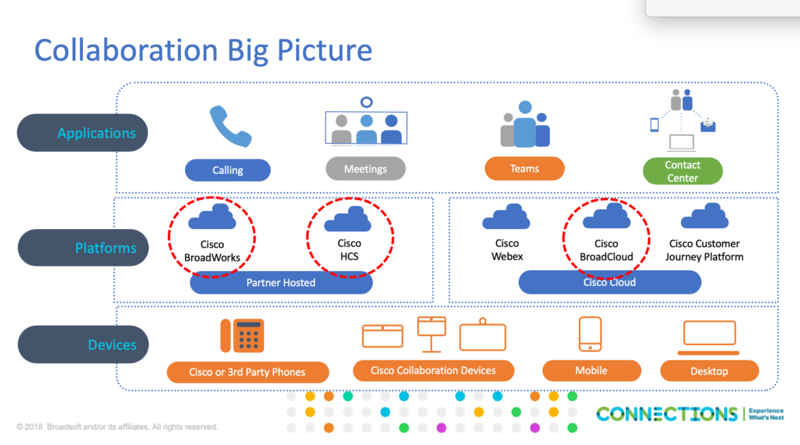 To help service provider succeed in the midmarket, Cisco announced a brand-new offer, which bundles Cisco BroadCloud Calling, Webex Teams, along with the Cisco Calling App client in a single offer - the Cisco Collaboration Flex Plan. With calling based on the BroadCloud platform, it brings cloud-based calling to Webex Teams as part of Cisco’s Flex Plan, with Webex Meetings and Customer Journey Platform (CJP) added as optional components. The offer will be co-branded, so that service providers can brand the Calling App, while the collaboration applications will be under the Cisco Webex brand. Service providers will be able to bundle Cisco IP Phones, Webex video devices and their own PSTN and other value-added services, to create packaged optimized for the 100+ user market segments. The new offer helps Cisco fill the midmarket gap that its Hosted Collaboration Service (HCS) wasn’t able to fill, providing a more cost-effective option for service providers and their customers, delivered through the Cisco cloud. Most of the service providers I spoke with at the event were impressed with this new Collaboration Flex Plan with the BroadCloud Calling offering and are going to spend some time analyzing the impact it will have on their business and identify whether and how best to take advantage of it. Of course, questions remain. Service providers on the BroadWorks platform (which is in their data center) will have a choice to move up to BroadCloud Calling or leverage the Cisco BroadWorks Flex Plan offer which will be available soon. Additionally, the new Collaboration Flex Plan offer with BroadCloud Calling bundles in Cisco devices and does not support third-party phones. Cisco notes that the intention is to provide a streamlined end-end experience for users and partners. For example, during Connections Cisco previewed the tight integrations around secure onboarding and device configuration, which could save partners time and effort when on-boarding users and devices. I expect that for the short term, most existing customers will remain on BroadWorks with the UC-One user experience and keep their third-party phones. As they reach out to new midmarket customers, service providers will take advantage of the BroadCloud Calling and the Collaboration Flex Plan. To help service providers better accelerate their time to success in a digital world, Cisco also introduced the Digital Accelerator for Service Providers. Replacing the “Powered by Broadsoft” program, the Digital Accelerator program is delivered through the new Digital Engagement Center, “a single location for Service Providers to access all the digital content, tools and services to engage customers.” The Accelerator program provides tools to help service providers differentiate themselves, generate leads, and increase sales effectiveness. It includes content, tools, playbooks, campaigns, and services that service providers can personalize with their brand to help accelerate the digital customer journey. I was very impressed with this program, as it provides the tools and support that many service providers need to help them better reach and engage with businesses and organizations on their customer journeys. Collaboration is clearly a big priority for Cisco. One of the best presentations and demos at Connections was from Lorissa Horton, GM for Webex Teams. In this video, Lorissa discusses Cisco’s collaboration portfolio for service providers, and describes Webex Teams and Webex Meetings, as well as the multiple calling options available such as click-to-call for Broadsoft Calling and the planned native cloud calling for Webex Teams. She also discusses integration with Microsoft Teams, and the use of AI and Machine Learning for Webex Assistant. Video has long been a cornerstone of Cisco’s offering, and the company announced several new offerings. Webex Board 85, the latest in Cisco’s Webex Board series. This is Cisco’s largest collaboration device, used for conferencing, content creation, whiteboarding, and sharing in large spaces. Webex Roomkit Mini, a new device designed for huddle rooms for up to 5 people. Webex Share, a palm-sized adapter that works with Webex Meetings and Webex Teams and turns any nearby TV or screen into a wireless presentation device. I spoke with Tom Richards, SME for Huddle Spaces, who describes the new offerings and what it means to service providers and their customers. Build a Value Canvas. Straton identified five elements of differentiation and introduced a Value Canvas based on product, marketing, sales, onboarding, and success. Act now, as the cloud communication market is in hyper-growth mode. In this video, Straton describes the key messages for service providers, noting Cisco’s continued support for investments that service providers have made. He also discusses Cisco’s contact center offerings, the Cisco Customer Journey Platform. Prior to the BroadSoft acquisition, Cisco didn’t have a viable cloud contact center solution, but CJP changed all that. In addition to adding CJP to the Flex Plan, Cisco also enhanced its cloud contact center offerings by launching Data Driven Intelligence and adding AI/Machine Learning and analytics. The company is also teaming with Apple for real-time agent conversations through Apple’s iMessage interface. Making it easier for customers to purchase the Cisco collaboration solutions, Cisco offers the Collaboration Flex Plan, an all-in-one subscription to give customers the flexibility (hence the name Flex) to move from premises-based products to the cloud. Cisco has been offering the Flex Plan for a while and has added BroadCloud Calling and the CJP cloud contact center offering. I spoke with Brian Blatnik, Director of Collaboration Offers, who describes the Flex Plan and how it works. As you can see, the Cisco and BroadSoft teams have been busy folding the BroadSoft business into the company, integrating the two companies’ products, and introducing new offerings for service providers. They’ve made tremendous headway, but of course there’s still a lot of work to be done. There were lots of answers, but there are even more questions. Cisco now has a plethora of offerings for service providers, some of which are new, while some are variations of existing products. As much as Cisco touts simplicity, its ordering and onboarding process still needs improvement, and both the migration strategy and roadmap clearly need to be simplified. That being said, the company has made a great deal of progress, and I expect to see more simplification and clarification in the coming months. 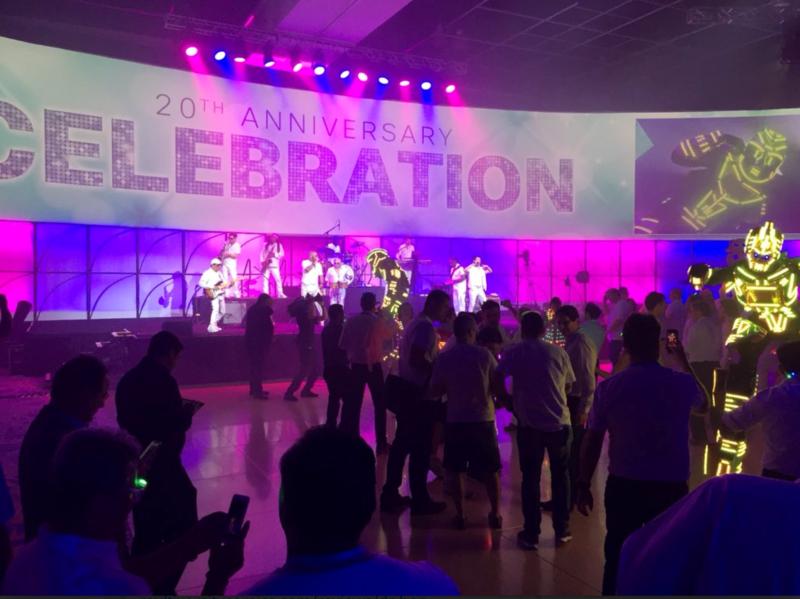 On a final note, when it comes to having fun, Connections is one of the best industry events around. Hopefully the tradition will continue.